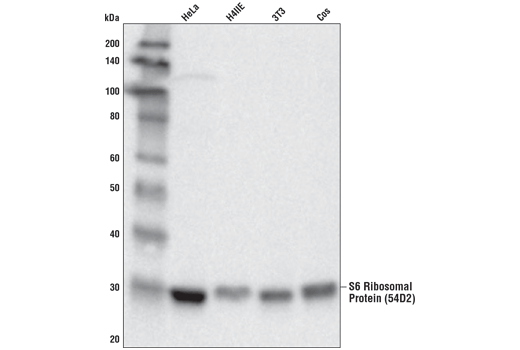 Western blot analysis of cell extracts using S6 Ribosomal Protein (54D2) Mouse mAb. 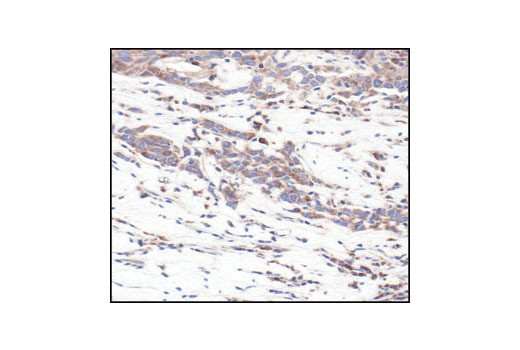 Immunohistochemical analysis of paraffin-embedded human breast carcinoma, showing cytoplasmic localization, using S6 Ribosomal Protein (54D2) Mouse mAb. 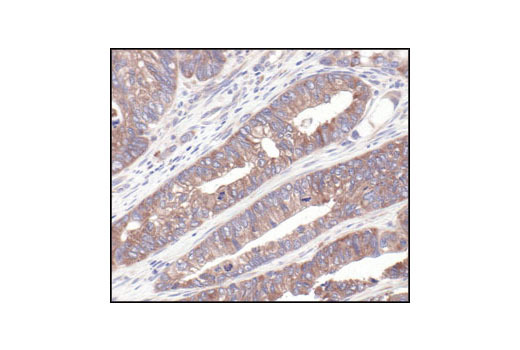 Immunohistochemical analysis of paraffin-embedded human colon carcinoma, using S6 Ribosomal Protein (54D2) Mouse mAb. 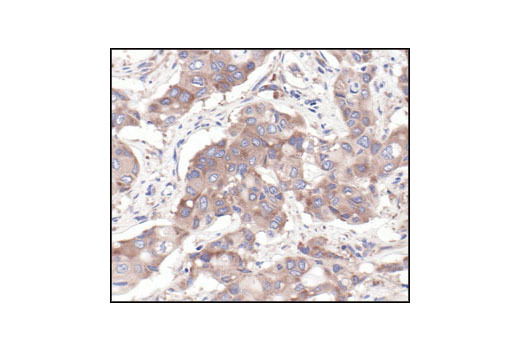 Immunohistochemical analysis of paraffin-embedded LNCaP cells, using S6 Ribosomal Protein (54D2) Mouse mAb. 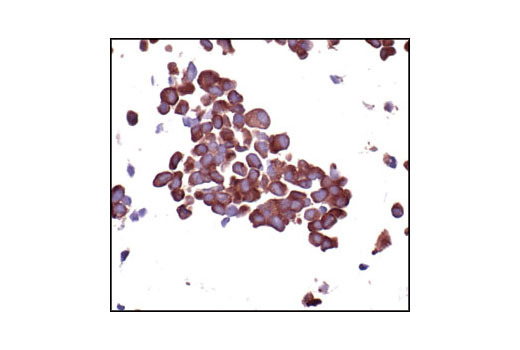 Immunohistochemical analysis of paraffin-embedded human lung carcinoma, using S6 Ribosomal Protein (54D2) Mouse mAb. 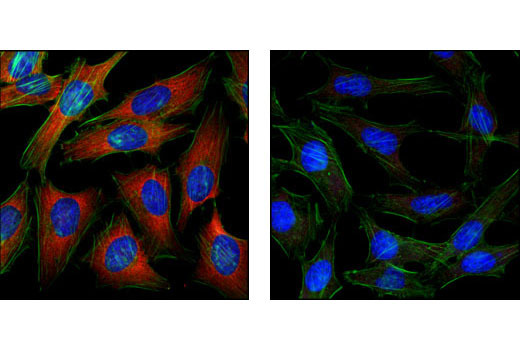 Confocal immunofluorescent images of HeLa cells labeled with S6 Ribosomal Protein (54D2) Mouse mAb (red, left) compared to an isotype control (right). Actin filaments have been labeled with fluorescein phalloidin. Blue pseudocolor = DRAQ5® #4084 (fluorescent DNA dye). Flow cytometric analysis of NIH/3T3 cells, using S6 Ribosomal Protein (54D2) Mouse mAb (blue) compared to a nonspecifc negative control antibody (red). 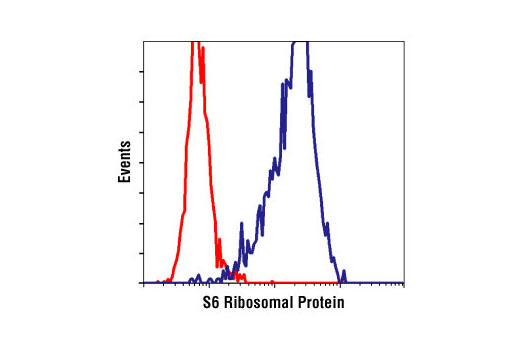 S6 Ribosomal Protein (54D2) Mouse mAb detects endogenous levels of total S6 ribosomal protein independent of phosphorylation. Monoclonal antibody is produced by immunizing animals with a recombinant fusion protein corresponding to full-length human S6 ribosomal protein. The epitope corresponds to a region surrounding Asp20 of human S6 ribosomal protein.